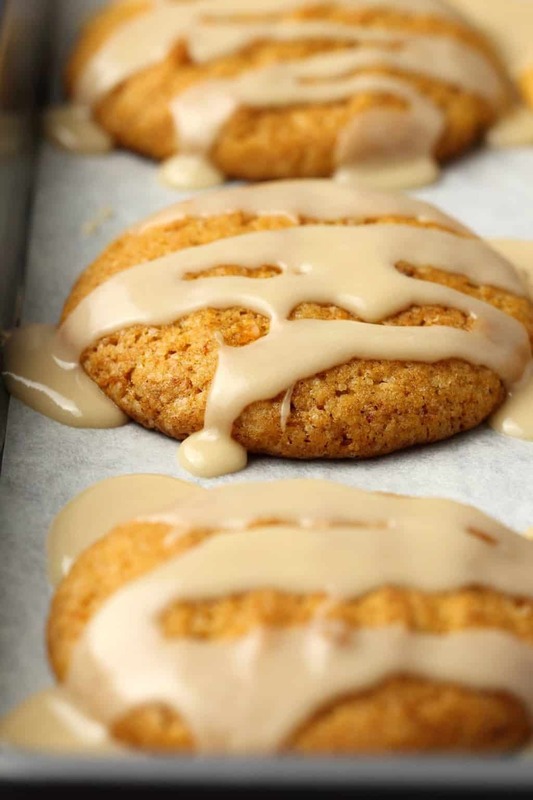 I had been trying ALL day to make some vegan pumpkin oatmeal cookies, but really could not get it right (will have to circle back to that one day!). 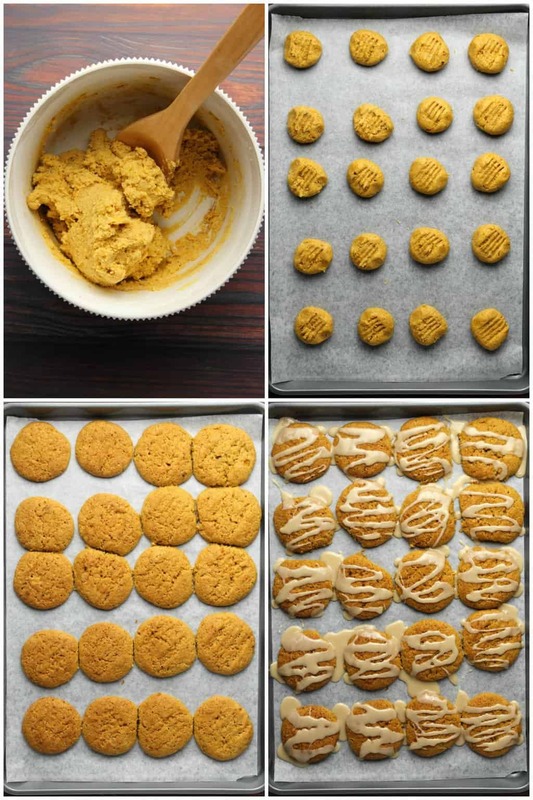 But I was determined to put together a winning recipe for pumpkin cookies and I was just not going to call it a day until I did! 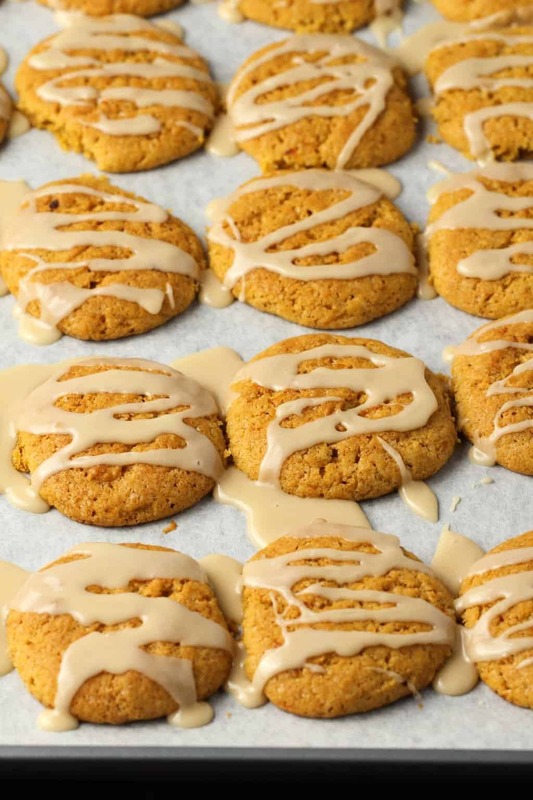 And then it suddenly occurred to me, well why don’t I just try some straight up pumpkin cookies and forget the oatmeal part altogether? And that’s when these happened. It was about 11pm by that time and I have never been so happy to succeed at a cookie! 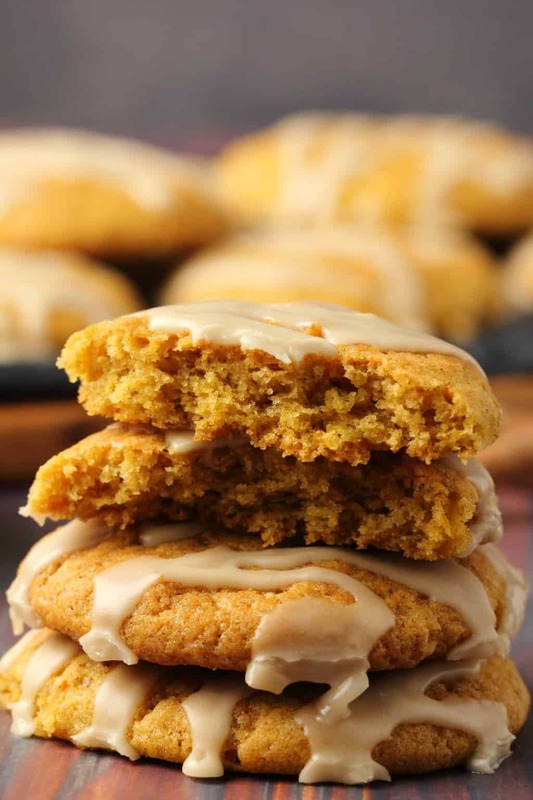 These pumpkin cookies are super simple, similar to a sugar cookie but even softer! They are super soft and melt in your mouth and they are topped with a delicious maple glaze. 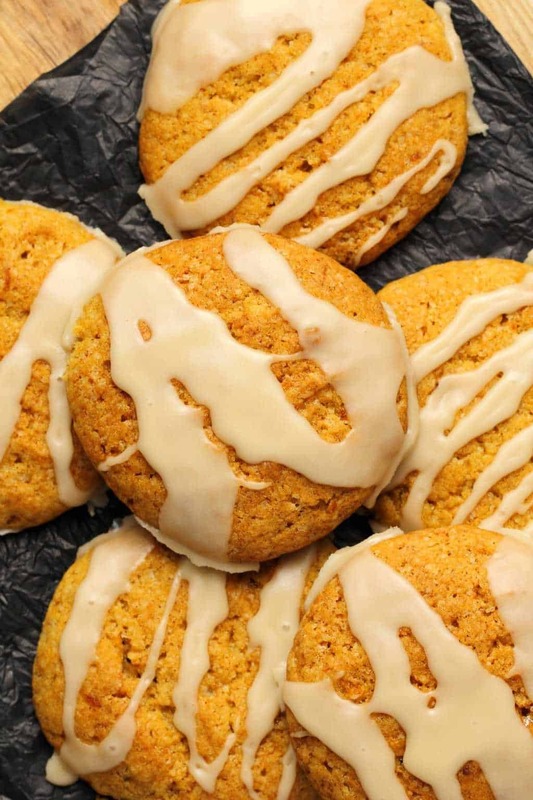 The delicious pumpkin flavor comes from pumpkin purée, cinnamon and nutmeg. 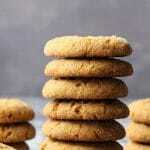 I used a mix of white and brown sugar in these cookies so that they have a lovely light texture but plenty of flavor. The maple glaze is a mix of powdered sugar, maple syrup, non-dairy milk and vanilla. 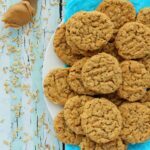 It has the perfect flavor blend for these cookies and you’re going to find it very hard not to eat the whole tray! Keep them covered at room temperature where they will stay fresh for a few days. 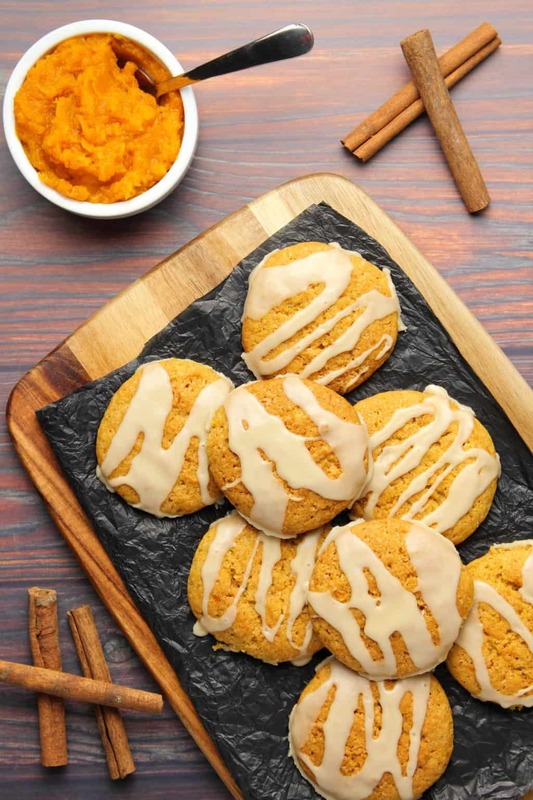 Let us know what you think of these vegan pumpkin cookies in the comments and please rate the recipe too! 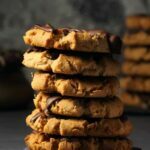 We’re kind of mad about cookies on this blog, so we have a ton of cookie recipes, but here’s just a few other vegan cookie options! Sign up to our email list and you’ll stay updated with all our latest recipes as they post to the blog, and you’ll also receive a recipe ebook (entirely free) with 10 delicious vegan dinner recipes. 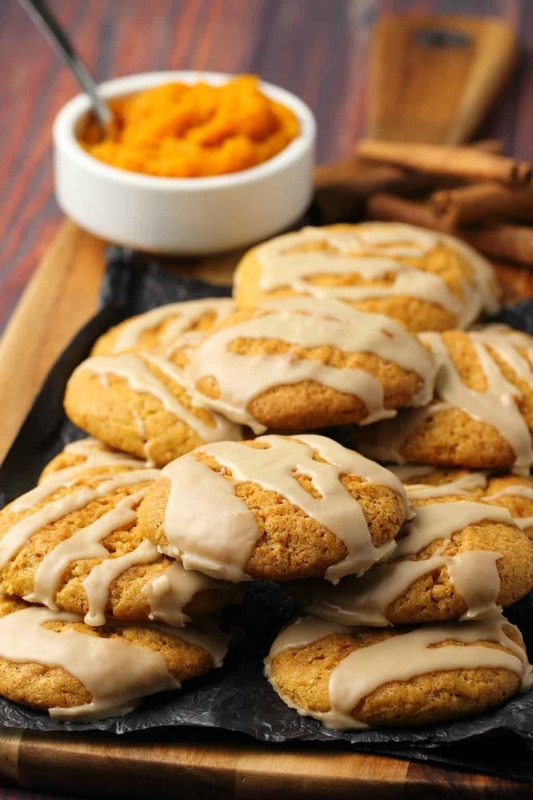 Beautifully soft vegan pumpkin cookies drizzled with a maple glaze. This simple recipe is perfectly spiced and perfect for fall! Add the vegan butter, white sugar and brown sugar to the bowl of a stand mixer and cream them together and then add in the vanilla and pumpkin purée. Then add in the all purpose flour, baking powder, baking soda, cinnamon, nutmeg and salt and mix in by hand (don’t use the electric mixer for this part). It will make a thick cookie dough that is a bit wet, a little too wet to roll with your hands. Scoop the cookie dough in roughly 2 Tbsp sized scoops out onto a parchment lined baking tray, aiming for around 20 cookies. Flatten with a fork. Bake for 15 minutes. When you remove them from the oven they will be very soft. Let them cool on the tray before moving them. Prepare your maple glaze by mixing up the powdered sugar, maple syrup, soy milk and vanilla in a bowl. 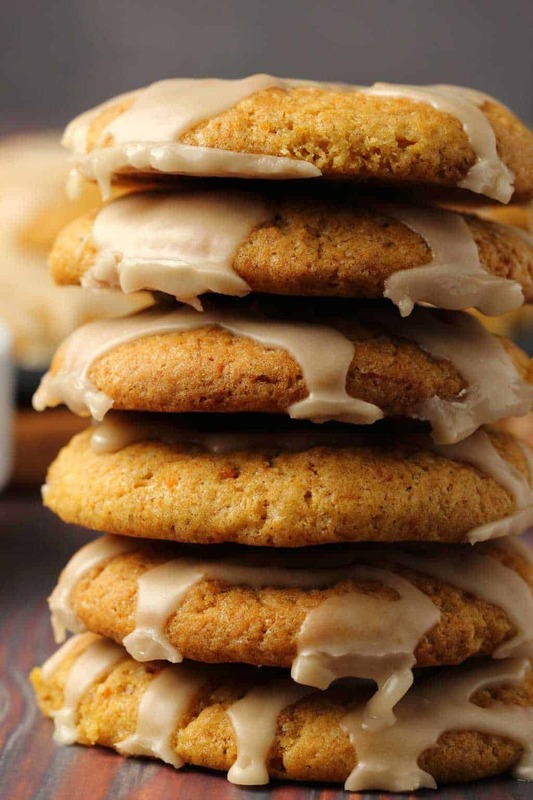 When the cookies have cooled use a teaspoon to drizzle the maple glaze over the cookies. *You can substitute almond milk or another non-dairy milk for the soy milk if you prefer. 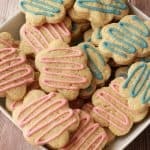 Delectable little cookies for that little teatime gathering of friends. 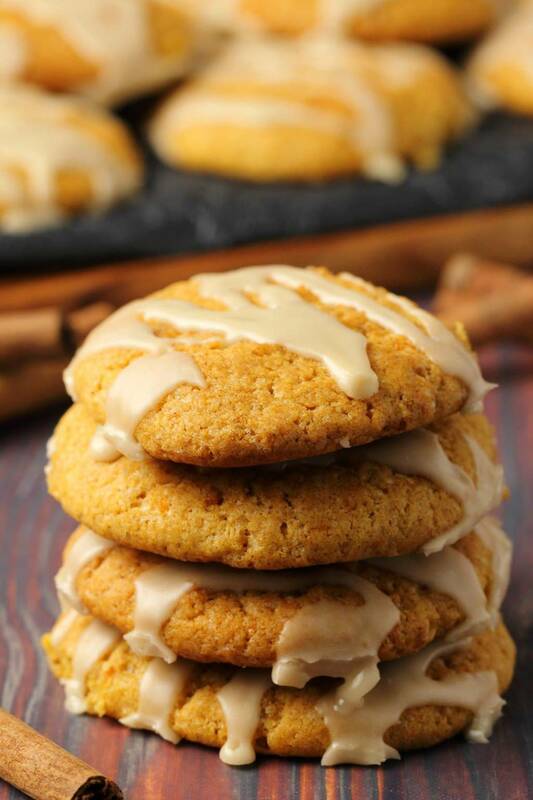 So many beautiful pictures of the perfect looking pumpkin cookie. This looks SO good. I made it today. it was 16 cookies and they are very soft and delicious. Yet, they are still soft….I took them out to cool but too soft to pick up. I used Miykoko vegan butter. I am not sure if a box of it is 1/2 cup. Maybe I should cut it half. What is your thought? Thank you. It smells like fall here in the house. Love it. A box of Miyoko’s is a full cup. Did you use the whole box? 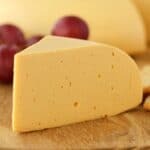 Is there a good substitute for vegan butter? I don’t use butter. 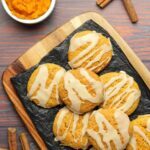 These look amazing and my hubby loves pumpkin. 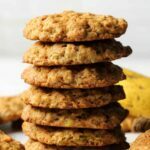 Hi Bev, you could try with coconut oil but the recipe was not tested that way so I don’t know if it would work, but others have done this on some of my other cookie recipes so it could work fine as a 1:1 replacement. Alternatively you can make your own vegan butter. Thank you for your response. Hubby loves all things pumpkin. These look great. 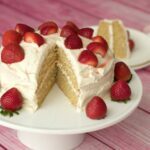 Can you use a different type of flour? 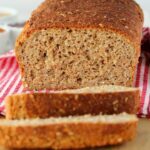 Like oat flour or gluten free flour ? Can I freeze these after they are iced? 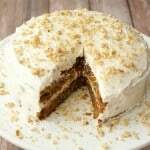 Can I use pumpkin spice instead of nutmeg? 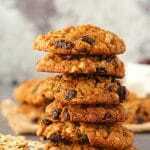 Just made these cookies and they’re yummy. My glaze seemed runny so I increased powdered sugar to 1-1/4 c. That seemed to thicken it but when I drizzled it onto the cookies it was invisible because it’s the same color! Can I omit maple syrup to make glaze more white? I realize I’ll be omitting maple flavor but I want glaze to be visible. Thx for any suggestions. 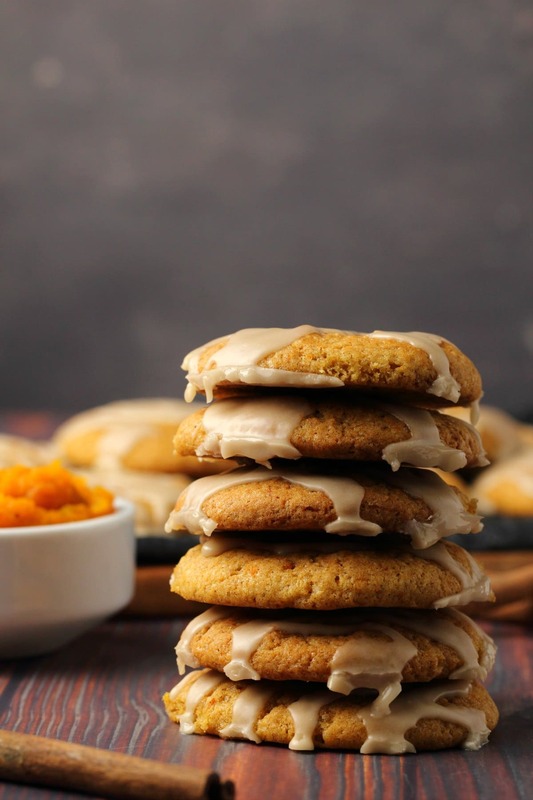 Just looked at the photo again and see your cookies are more orange than mine so maybe that’s why my glaze isn’t visible against the cookies. I wonder why my cookies turned out more tan color than orange. I followed recipe exactly! Thx for any thoughts. In any case, they’re delicious. Good to know – thanks. Fyi, they didn’t last more than 24 hours. I personally polished off more than I care to count and did manange to leave some for my kids. Lol.